Spinach is a source of Vitamin A. 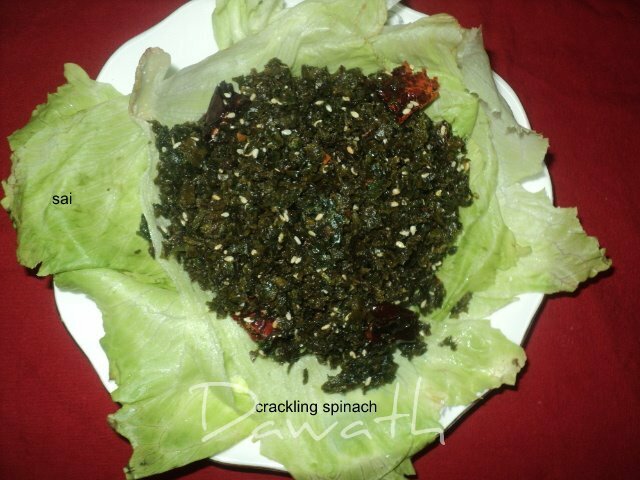 It is rich in iron,calcium and protein. It is a powerful disease fighting antioxidant. Coming back to the recipe first time I ever tasted this dish was in Mainland China. I found this recipe in their website and tried it . It turned out excellent. Wash the spinach well, dab it in a clean kitchen cloth, remove the water and chop the spinach into julienne. Sprinkle lots of corn flour on it. In hot oil deep fry the dusted spinach till crispy. Put the fried spinach on an absorbent paper to drain the oil. Heat wok/pan on a high heat. Add the deep fried crispy spinach. Add sesame seeds and toss till seasoning covers the spinach.